>Going somewhere? Play Punch Buggy / Slug Bug! 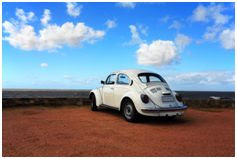 Look for Volkswagen Beetles (Bugs). Whenever you see one (old styling or new styling–it doesn’t matter), yell, “Punch Buggy White (or whatever colour it is)!” Then lightly punch the person riding with you in the arm. Also add, “No punchbacks!” or else they can call that same car on you and punch you back! If so say no punchbacks, it means nobody can use that punch buggy again. Variations: Some people call them Pinch Buggies and pinch instead of punch. And some people call this game Slug Bug. As well, if punching isn’t your thing–OUCH!–try variations such as a gentle nudge, a tap, or simply calling out with no actions. Make this a family activity: Get everyone looking for a punch buggy. Break into teams if there are a lot of you riding together. This activity promotes keen eyesight and quick visual identification. Playtime is more fun when it's shared with others. Share this post with your friends.